The Sea Queen is the new novel from author Linnea Hartsuyker. It is the direct sequel to The Half-Drowned King. The novel is set during Norway's “Viking Age,” specifically the time that marks the ascendancy of the first King of Norway, Harald Fairhair (called Harald Halfdansson in this novel). The Half-Drowned King focuses on a brother and sister who both play pivotal roles in Harald's campaign to defeat his enemies and unite Norway under one king. Ragnvald Eysteinsson was known as “Ragnvald the Half-drowned.” Now, he is king of Sogn, the land his late father claimed, but he has been away from home fighting battles for King Harald. That has allowed a usurper, Atli Kolbrandsson, to make a claim on Sogn, a move that is just one example of a political landscape that grows more treacherous. Meanwhile, Ragnvald's sister, Svanhild, has found freedom and adventure as the wife of rebel explorer, Solvi Hunthiofsson. Sailing the seas at her husband's side, Svanhild is known as “the Sea Queen,” because she is more capable at the helm of a ship than most men. However, Solvi has desires and ambitions; he wants to recapture lands he claims as his own, but that is controlled by Harald or his allies. Solvi returns to Norway, which leads to tragedy and drives a wedge between he and Svanhild. A rebellion grows and unites Harald's enemies and also some he thought to be allies. Ragnvald suspects that some nobles are not really loyal to Harald's dream of a unified Norway. He sets a plan in motion to bring down enemies and traitors alike, but like his sister, he will make decisions that will cost him in the most personal ways. THE LOWDOWN: I wrote in my review of The Half-Drowned King that my summary of the novel focused on Ragnvald, although his sister Svanhild played a major part in the novel. Svanhild is the lead character in about a third of the first novel, but The Sea Queen is as much her story as it is her brother's or Harald's. The Sea Queen is allegedly only author Linnea Hartsuyker's second novel. I say allegedly because Hartsuyker either previously wrote under a pen name, or she is just simply a natural at this novel-writing game. Hartsuyker not only provides a deeply intimate portrayal and depiction of Svanhild and Ragnvald, but she also bares the souls, the cores, and the naked ambitions of numerous characters in this novel. Truthfully, many of them, including Solvi, Atli, and King Hakon (a frenemy), to name a few, could be the lead in this series. Hartsuyker gives readers the details and local color in droves, as she mixes myth, legend, and history to transport her readers to a time in “pre-history” Norway of uncertain duels, fierce battles, sudden raids, and ancient blood feuds. It is her wonderful cast of characters, however, that truly makes The Sea Queen a page-turning, electrifying read. Linnea Hartsuyker is subtle in the way she pushes Svanhild to the front, but she is equally crafty in creating a book full of characters that you cannot stop thinking about even when the story moves from one to another. I heartily and highly-recommend The Sea Queen to readers who just love a good book just filled with superb and engaging characters. 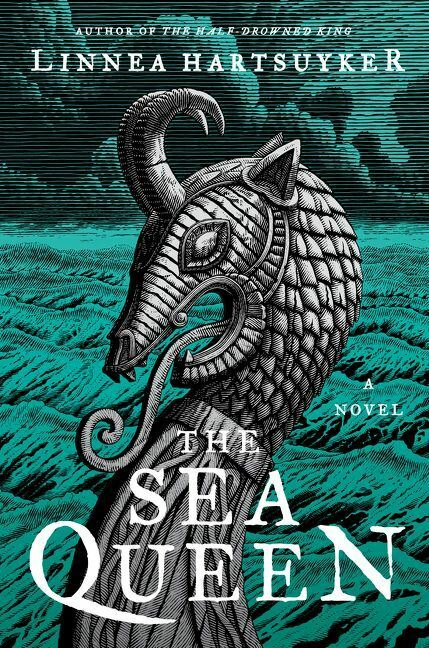 I READS YOU RECOMMENDS: Fans of “Game of Thrones” and of historical fiction will want to read, The Sea Queen.